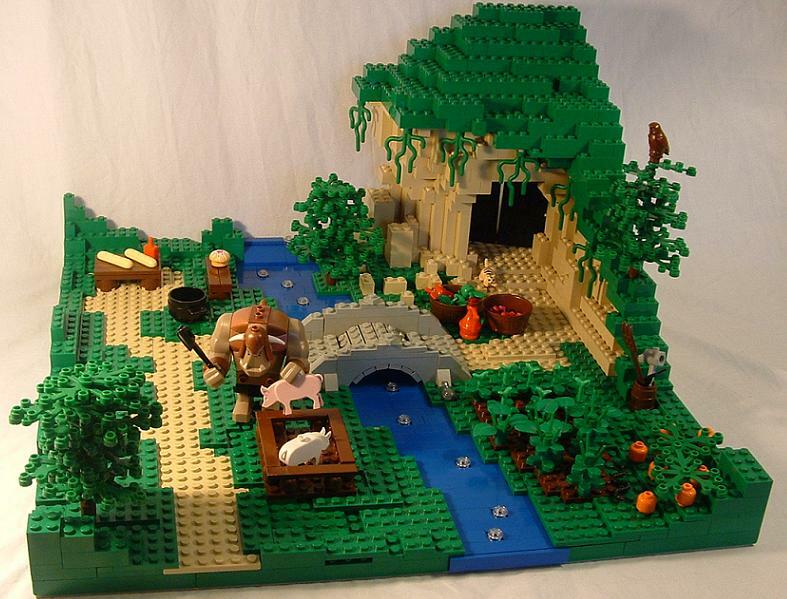 Just your basic farm, owned by troll. His name is Clancy and he’s a pacifist. Most trolls enjoy mucking about, destroying things, bashing people on the head, that sort of thing. Clancy likes peace and tranquility. However, that doesn’t mean that he doesn’t enjoy a good ham sandwich now and then! I really like this, the orange minifig heads are cool. Are they pumpkins? It reminds me of a game called runescape. I do believe they’re pumpkins. Such a nice and detailed set. I like the stable for the pig. reminds me of a certain green ogre at the movies. Well done, and great job adding dimension and personality to what is usually a retarded troll figure. Hurray for Clancy the pacifist troll! Apparently, he’s also a baker who makes muffins. The river is my favorite feature of the landscape. Whew! You’ve been busy! Great job!